Applicant Pro, a complete hiring software solution, began operations in 2007. Based in Eagle Mountain, Utah, Applicant Pro serves over two million monthly job seekers to over 2,700 clients. Applicant Pro manages the hiring process from end-to-end — from sourcing to onboarding. You get a branded, mobile-optimized career site with online applications — usually up and running in less than 24 hours. Also, since they connect to over 500 job boards, Applicant Pro allows you to broadcast your job openings to the largest possible audience. Thanks to integrations with social media, you can further boost your reach and frequency, pushing your openings to various platforms, tracking results and referrals, and allowing your employees to leverage the power of their social networks to help you fill positions — without interfering with company marketing messages. Once the applicants are rolling in, Applicant Pro reviews resumes, automatically disqualifying those that don’t meet your minimum requirements. Once you’ve got your targets, Applicant Pro allows an unlimited number of managers to participate in the hiring process; managers, HR, and other stakeholders can rank applicants using a 5-star rating, which Applicant Pro reviews and averages. There are also two other, customizable ranking features that can be deployed using your own, internal criteria. Once they get to this point, Applicant Pro can administer work value tests, video interviews, drug and background checks (even DOT checks), and skills tests, allowing you to further screen candidates with and only schedule the best candidates for in-person interviews. Once you’ve made the decision to hire a candidate, Applicant Pro manages the onboarding process as well. 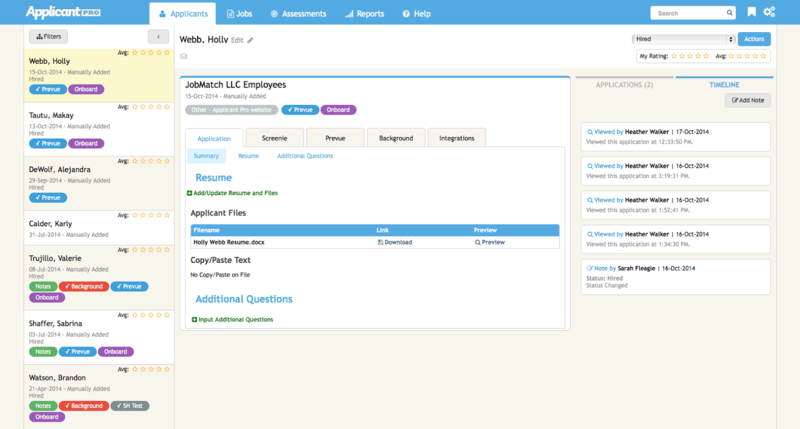 Offer letters and reference checks, new hire paperwork, eVerify, tax credits — all in the same platform. We recommend Applicant Pro to any company, large or small, looking for a SaaS solution for recruiting, hiring, and onboarding, but especially to those small-to-medium firms looking for a tool that can grow along with them. Have questions about Applicant Pro? Want to learn more about your applicant tracking software options? Call, click, or email to speak with an unbiased Technology Advisor for a no-cost, no-obligation consultation on your unique requirements. Learn everything you need to know about Applicant Pro. Our experts will reach out to you shortly.